Drugs acting on the autonomic nervous system: cholinergic and adrenergic agonists and antagonists ....drugs acting on the heart..antihypertensives …. Pharmacological control of myocardial function, vascular resistance, heart rate and blood pressure. Esmolol is recommended for the acute treatment of supraventricular tachyarrhythmia (SVT), including paroxysmal supraventricular tachycardia (PSVT), rate control in non pre-excited AF or atrial flutter, ectopic atrial tachycardia, inappropriate sinus tachycardia, and polymorphic VT due to torsades de pointes or myocardial ischaemia. As a clear solution for injection containing 10/250mg/ml of Esmolol hydrochloride. Competitive blockade of beta-adrenoceptors; the drug is relatively selective for beta-1 receptors and has little intrinsic sympathomimetic activity. Administered by iv infusion diluted in any crystalloid (not sodium bicarbonate) at a rate of 50-150ucg/kg/min according to response. The major advantage of Esmolol is that its peak effects are observed within 6-10 minutes of administration, and wear off within 20 minutes of cessation of infusion. Esmolol is administered as an IV loading dose of 0.5 mg/kg over one minute, followed by a maintenance infusion of 50 mcg/kg per minute for 4 minutes. If the response is inadequate, a second bolus of 0.5 mg/kg is infused over one minute, with an increase of the maintenance infusion to 100 mcg/kg/minute. The bolus dose and the titration of the infusion dose (addition of 50 mcg/kg/minute) can be repeated every 4 minutes to a maximum infusion rate of 300 mcg/kg/minute. Infusions can be maintained up to 48 hours if needed. 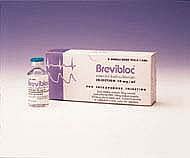 Esmolol requires no dosage adjustments with renal or hepatic impairment. Esmolol is a very short acting agent with an average half-life of 9 minutes in adults. Fall in blood pressure and a dose dependent fall in heart rate. Cardiac output falls by 20%. Esmolol obtunds the cardiovascular responses to intubation and sternotomy, and protects against infarction in animal models of myocardial ischaemia. Little effect on airways resistance. Hypotension, bradycardia, bronchospasm, nausea and vomiting, alteration of taste and CNS disturbances may occur. 56% protein-bound in plasma. Volume of distribution 3.4 l/kg. Hydrolysis by esterases in red blood cells to methanol and a primary acid metabolite which has weak beta-adrenergic antagonist activity. Elimination half-life is approximately 3.5 hours. 80% appears in the urine as the major acid metabolite. <1% is excreted unchanged. Click here to view the latest guidelines for management of Narrow Complex Tachycardia (use of Esmolol recommended). [i] Use of beta-blockade to prevent death after noncardiac surgery. Wallace A, Mangano DT. West J Med 1997 Mar;166(3):203-4. [ii] Reduction of Myocardial Reperfusion Injury by High-Dose beta-Blockade with Esmolol. Geissler HJ. Thorac Cardiovasc Surg 2002 Dec;50(6):367-72.